MANILA, Philippines – The results of the August 2018 Special Professional Licensure Exam (SPLE) for Radiologic Technology (RadTech), together with the list of passers, top 10 examinees, performance of schools and related announcements are available at this website as PRC officially releases the results online few weeks after the last day of board examination. As announced, 10 out of 50 examinees passed the exams. The August 2018 SPLE for RadTech was administered by PRC Board for Radiologic Technology headed by its OIC, Mr. Reynaldo Apolonio S. Tisado and its members, Dr. Orestes P. Monzon, Mr. Bayani C. San Juan and Ms. Ma. Jesette B. Canales on August 24 & 25, 2018 at PRC testing locations in Abu Dhabi, United Arab Emirates; Al-Khobar, Jeddah and Riyadh, Kingdom of Saudi Arabia; Bahrain; Qatar; Kuwait and in Oman. The Professional Regulation Commission (PRC) recognizes the top 10 examinees who garnered the highest examination ratings in any of its administered licensure exam. Shown below is the complete list of top 10 examinees for August 2018 SPLE for RadTech and X-Ray Tech including the school they're from as well as their rating. The list is courtesy of PRC. Shown below is the complete list of schools' performance for RadTech special licensure exam. PRC is strictly implementing the online registration system for all passers effective March 30, 2016. Initial registrants are advised to register online via http://online1.prc.gov.ph/, an online application and registration portal of PRC. 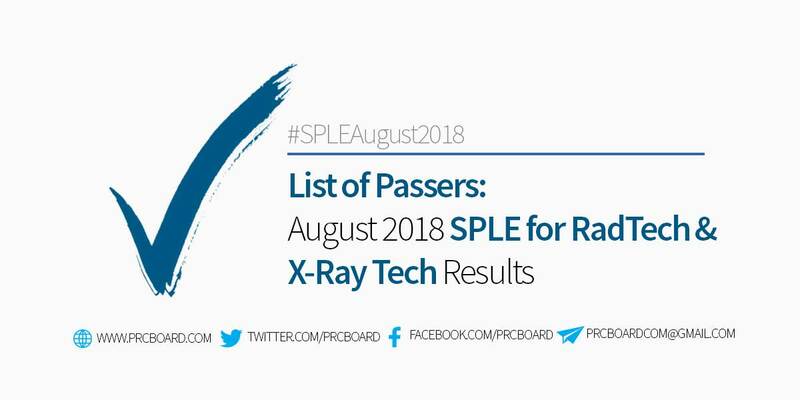 To receive up-to-date news about August 2018 SPLE for RadTech and X-Ray Tech results, we advise our visitors to bookmark this page, visit PRC official website or follow us at our social media pages via Facebook and Twitter.